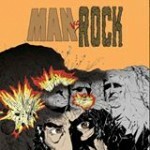 Man vs. Rock – AiPT! Kevin Bieber - Co-writer of the popular self-help guide "Man vs. Rock," and obviously named after YouTube sensation and 19th century American suffragist Margarete Bieber, Kevin Bieber has carved out quite the niche for himself in the comic book world. His first publication, "Dial-Up: The Future of the Internet," while widely ridiculed when published in 2013, garnered much attention for its controversial, extreme right-wing views. In his spare time, Kevin enjoys attending POGS conventions and listening to his favorite musician, Justin ... Timberlake. Victor DeTroy - The other half of "Man vs. Rock." 5'2" in height, Maine's native son has established himself as a powerhouse in the industry, as both an extra on the popular sitcom, How I Met Your Mother, and as the third key grip of the critically acclaimed move, R.I.P.D. When not writing fan fiction of the TV-series, Home Improvement, Victor spends his time collecting exotic bullfrogs.